After the recent runaway success of their first real-money mobile slot machine, Slotland.com has added another all-time favourite to their popular mobile games. 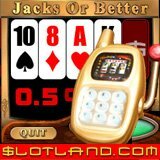 “Jacks or Better” is a slot machine based on video poker that can now be played both online and on mobile phones or PDAs. The object of Jacks Or Better is to obtain the best possible poker hand. On the initial deal, players are dealt five cards face up. They can hold all cards dealt or get up to five new cards. When Slotland.com, the world’s most popular all-slots web site, first introduced its all time favourite “Lucky Stars” machine for mobile phones and PDAs, it was an instant success. Over $3.5 million was wagered by players in bank queues, lunchrooms, and subway trains all over the world on the second day of the service. Long known for their customer service and frequently won progressive jackpots, Slotland.com is also becoming known for its philanthropy around the world. The company has sponsored amateur sports for some time and is currently building a school that will give new hope to a small village in Africa. To download either of Slotland.com’s mobile games logon to http://wap.slotland.com using the browser on any mobile phone or PDA.